Second Lieutenant BARON ALEXIS GEORGE DE GUNZBURG Attd. Royal Horse Guards who died on Friday 6 November 1914. Age 27. Second Lieutenant BARON ALEXIS GEORGE DE GUNZBURG Attd. Royal Horse Guards who died on Friday 6 November 1914. Age 27. Youngest son of the late Baron, and Baroness de Gunzburg, of 199, Boulevard St., Gennain, Paris. 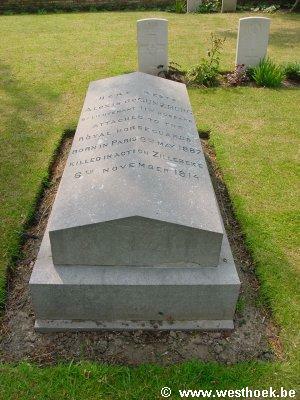 ZILLEBEKE CHURCHYARD Grave B. I.